Trump's Triumph or Kim's Coup? This week, President Trump went to Singapore to meet with the most repressive dictator on the planet, North Korean Supreme Leader Kim Jung Un. Kim presides over a slave state of 25 million people, with gulags stacked with hundreds of thousands of political dissidents. He has diligently pursued nuclear weapons and long-range missile tests. He was greeted as a celebrity in Singapore, with President Trump shaking his hand, calling him "very smart" and "a funny guy" and generally praising him to the skies. Here's the truth: We don't know what this will be yet. 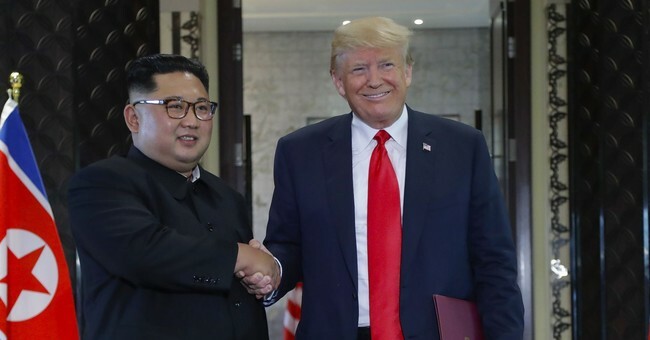 If it turns out that Trump has a trick up his sleeve -- if it turns out that Trump has indeed convinced Kim to denuclearize and liberalize his country -- then this will go down in history as a move of extraordinary genius. If, however, it's a photo op designed to allow Trump to claim status as a diplomatic wizard, and if Kim gives up nothing while the United States legitimizes an evil tyrant and ratchets down military exercises with South Korea, it will be a debacle. But it doesn't appear that the White House thinks of it that way. Instead, it seems to view the summit as an unalloyed win for President Trump no matter what happens next. Trump, they say, can always reverse himself. Trump himself made the same point: "Honestly, I think he's going to do these things. I may be wrong. ... I don't know that I'll ever admit that, but I'll find some kind of an excuse." And herein lies the problem. Trump has a stake in (SET ITAL) not being wrong (END ITAL). That's why presidents typically don't hold face-to-face get-togethers with evil dictators until some sort of serious negotiation has already taken place. Trump is now invested in the success of his diplomacy, rather than in the strongest possible outcome alone. That's a win for Kim, at the very least. Trump has given Kim an advance against the possibility of future concessions. If those concessions never materialize, Trump will be forced to choose between admitting he was bamboozled and brazening through the humiliation, pretending that Kim is in fact a moderate force willing to work with him. Right now, barring additional evidence of North Korean surrender, Kim has the upper hand. That could always change tomorrow; we should hope and pray that it will. If it doesn't, then President Trump not only won't get a win out of the North Korean summit; he'll have been played by a tin-pot dictator with a penchant for murdering his family members.